This lobster macaroni salad is dressed quite simply (and perfectly) with mayonnaise, a little lemon juice, and a few herbs. The salad is versatile, but try to avoid stronger ingredients — e.g., onions or bell pepper — that might overwhelm the delicate flavor of the lobster. A small amount of shredded carrot or summer squash can add color and texture to the dish without overpowering the main ingredient. The salad would make an elegant addition to a special luncheon or dinner, or make it​ to simply ​celebrate the season with your family. It's the perfect supper salad for a hot summer evening or great for a twist on the macaroni salad barbecue classic. Add some fresh sliced tomatoes and cucumbers and serve it with a dry white wine. Chardonnay, Gewurztraminer, and Pinot Grigio are all good choices. For a seafood macaroni salad, make it with cooked shrimp, crabmeat, or a combination of shellfish. Cook the macaroni in boiling salted water following package directions. Drain and let cool thoroughly. In a large bowl, combine the macaroni, lobster, and celery. Add 3/4 cup of mayonnaise, lemon juice, and the snipped chives or dill. Toss to blend. Add more mayonnaise to moisten, if desired. Just before serving time, line a serving bowl with lettuce. 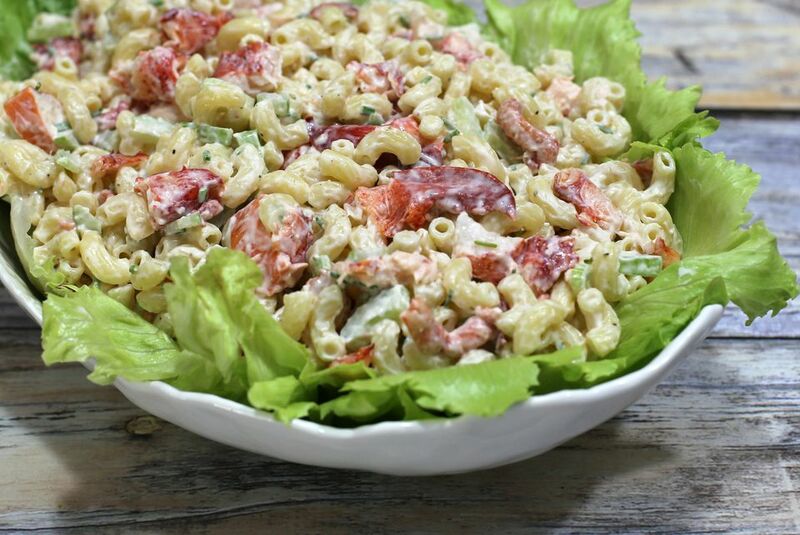 Spoon the lobster macaroni salad into the lettuce-lined bowl. *Three to four 1 pound lobsters should yield about 12 ounces of meat.